Today was an easy one. We planned to meet Thomas and Jack (our buddies from home and our ticket around the Rakaia) at Harper River Camp today/tonight. They’ll be joining us on the trail until Tekapo! With only 19 km to go, we had a lazy morning, playing a few hands of hearts before leaving the “Hamilton Hilton” behind at around 10:00 AM. 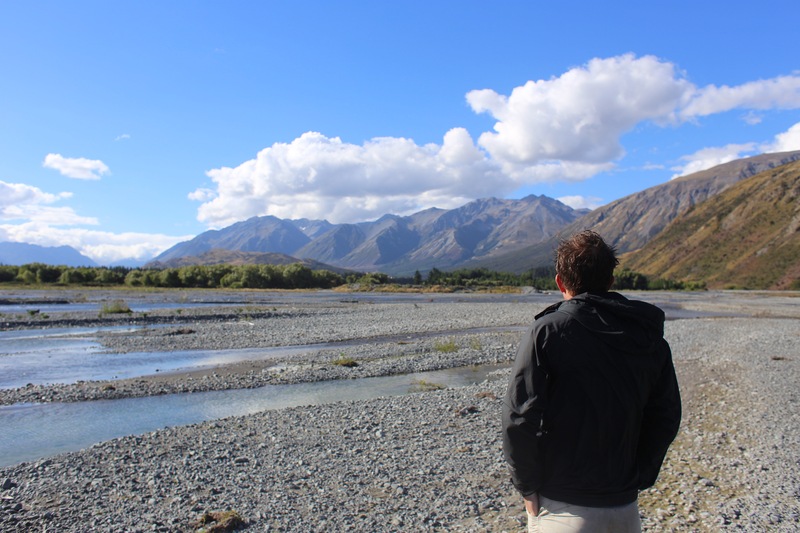 Before that I had a conversation with Sam and Julie about their plans for getting around the Rakaia/Rangitata. Originally we were thinking about attempting to cross the Rangitata, but will instead speak to Wayne from Alps2Ocean about a shuttle around when he comes to Harper River to pick up Sam and Julie. Sounds a bit too sketchy for us. 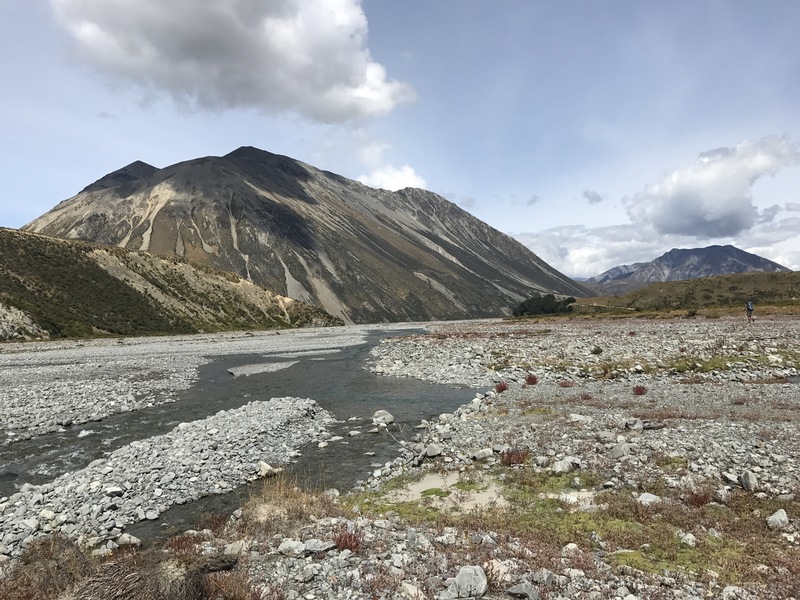 As Warwick the Kiwi we met yesterday put it, the catchment for the Rangitata is so far above the potential crossing that there’s no real way to tell whether or not there’s a storm filling the river from way above. The river can rise to a deadly level in less than an hour which is particularly scary given that it can take over an hour to make the full crossing. The same is true of the Rakaia to an even more dangerous extent, but we decided long ago not to consider that one at all. Anyway, we got walking through the beautiful Harper River Valley, picking our way through rockfields on the true left bank. Shepard cut open his toe in Arthur’s pass, so we were doing our best to keep from crossing the river in order to keep the bandage dry. We pushed through some awful gorse on the left bank and eventually decided crossing would be better than the gorse and swamp. We crossed back and forth several times, Shepard hopping across on one foot to keep the bandages dry. We lost count quite quickly of the number of crossings we did. We broke for lunch just after seeing “the pinnacles,” an awesome erosional feature on the true right bank of the river. 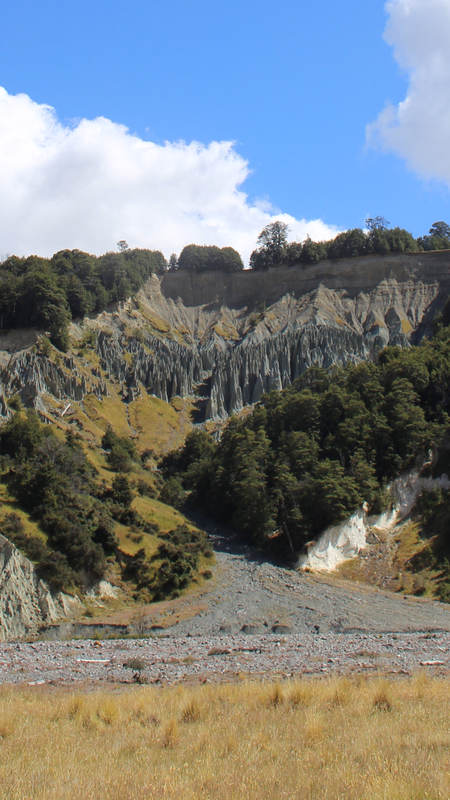 Huge grey rock spikes jutted from the ground, creating a dense forest of earthly protrusion. After lunch we crossed the Harper again, bringing us to the most established 4wd track of the day. The track brought us to the fence of a station which we stayed left of for 3-4 km. The great weather made for a hot couple kilometers. The heat was outweighed, however, by the mountains around us and the increasingly visible snow-capped peaks in the distance. After the fence walk we soon came to a gravel road, which we walked until the junction to the Harper River Campsite. 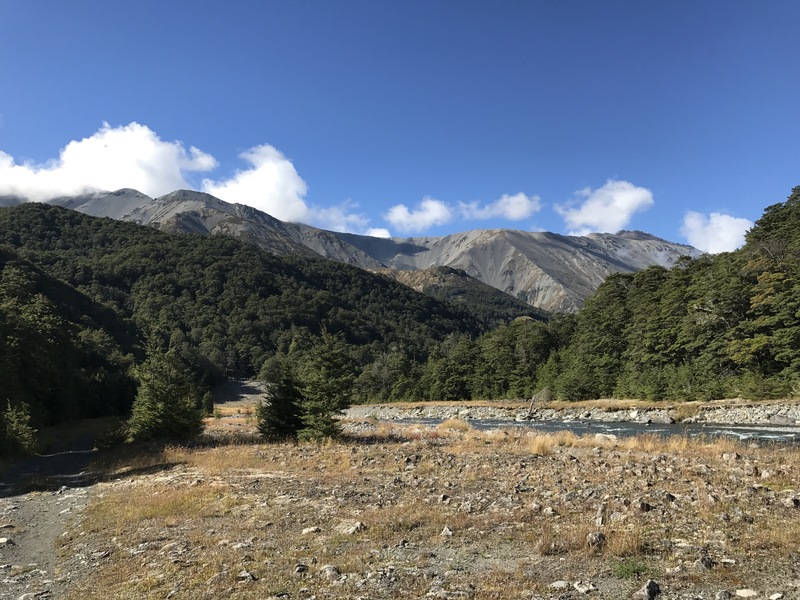 We sat at the site’s picnic table and talked for a while about our plan for the next few days, deciding to add a day so as to not rush through to the Rangitata. We have an extra day of food that rolled over from this section, which we will add to our 7-day box we’ll pick up tomorrow. This way, we’ll have 2 extra days of food should the weather keep us from moving in the two-thumb range. 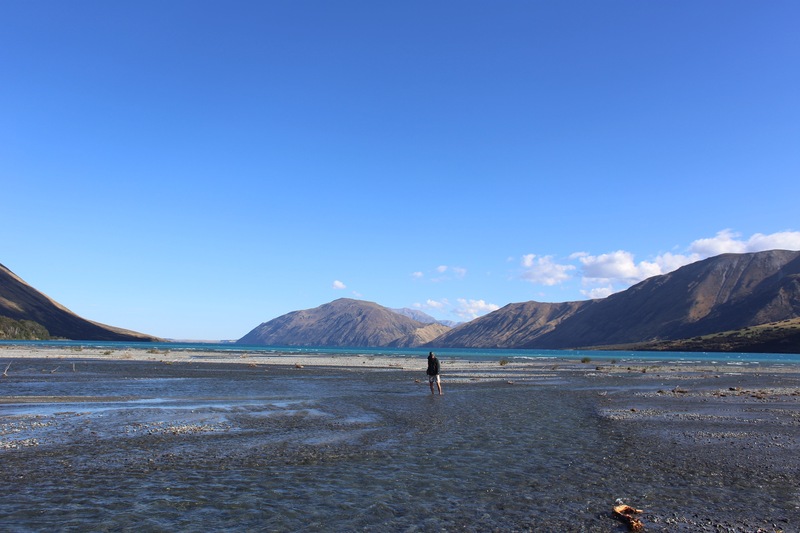 We headed down the gravel road about a kilometer to check out Lake Coleridge. The huge windy bright blue lake is surely worth checking out. Jack and I went for a swim out in the choppy water and admired the epic mountains around us. 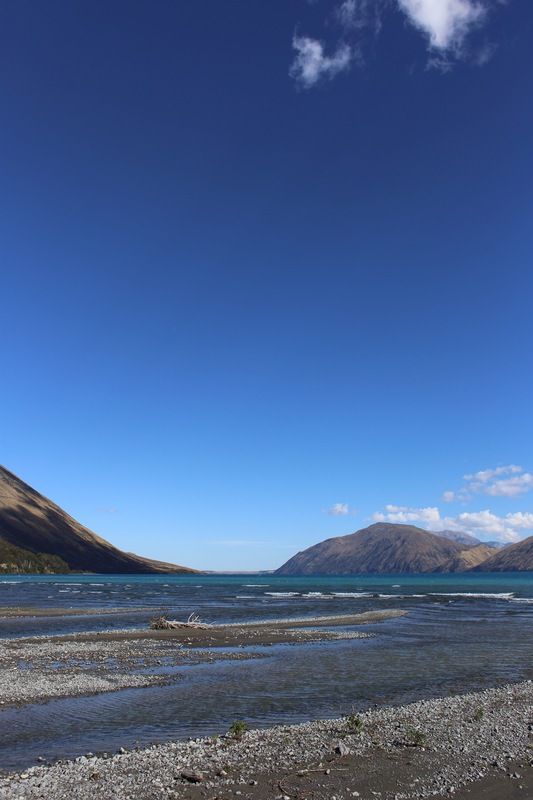 Classic New Zealand scene: stunning blue water all wrapped up in an explosive rim of high mountains. Very psyched to be here. We headed back to the site to find that Shepard had come back and met Thomas and Jack, who had arrived while we were gone. After saying some loving hellos and catching up about our past few weeks (since we last saw Thomas and Jack in Nelson, before they dropped us off at Pelorus Bridge), we made dinner. We had chicken noodle soup with spaghetti, while Thomas and Jack cooked up their steak and veggies. If all goes right tomorrow, we’ll pick up our box at Coleridge and head down and around the Rakaia. 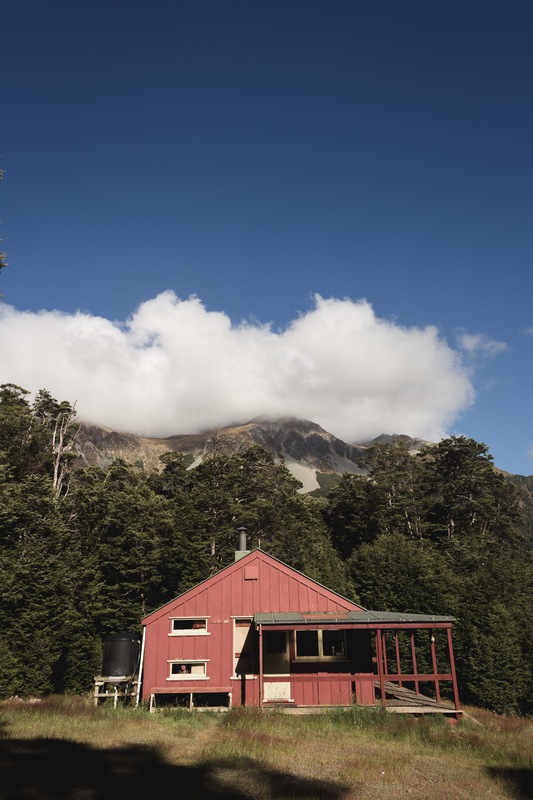 We hope to make it to Comyns Hut tomorrow so we are hoping for a smooth ride and food pickup. Thomas and Jack are nearly out of gas, so hopefully the guys they spoke to just outside of the Harper River Campsite will pull through on their promise to bring us some in the morning. Fingers crossed.